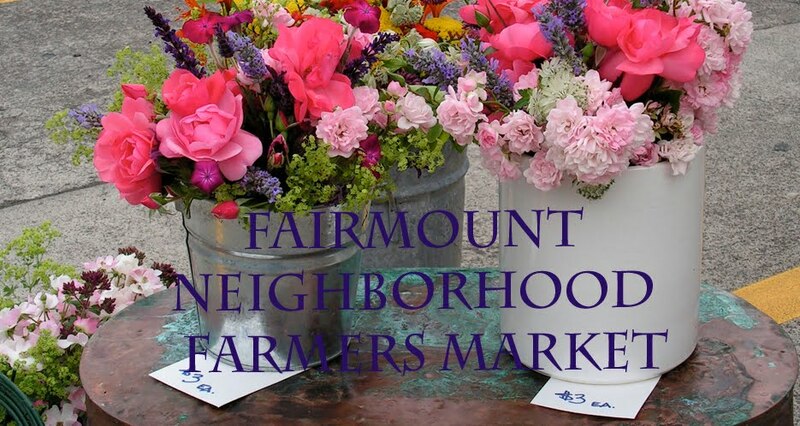 Be sure to savor the end of summer this Labor Day weekend with a trip to the Fairmount Neighborhood Farmers Market for some pretty tomatoes and flowers, and perhaps a stop at Eugene City Bakery for coffee and treats. 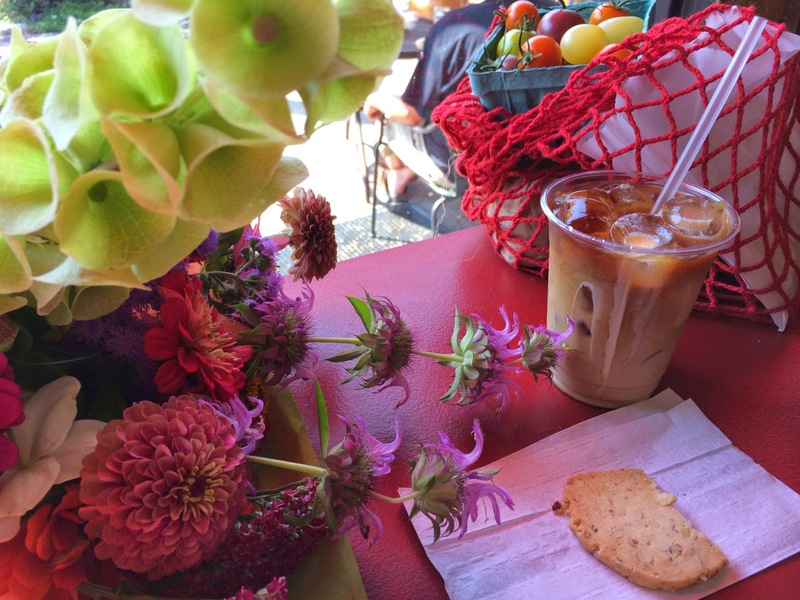 Labor Day weekend is also a good time to devote to preserving some of summer's bounty for the winter months ahead. This past weekend I slow roasted about six pounds of Sweeter Farm roma tomatoes, a project that requires very little effort (halve the tomatoes) but lots of time (10 to 12 hours at 200 degrees C) and is best undertaken overnight, meaning that you awaken to intense tomato fumes and a craving for an English breakfast. These tomatoes can be frozen for addition to pasta sauces, bean or grain salads, pizza, and wintertime BLTs, but we already made major inroads into our stash before I could freeze any of them. They proved to be especially tasty as a bed on which to layer olive oil poached fresh Oregon albacore tuna for a fancy Salade Nicoise. You can't see the roasted tomatoes in the photo below, but they are doing their job infusing the fish with extra flavor from below. I'll be picking up another flat of roma tomatoes this weekend for additional Labor Day projects. Wash the tomatoes and slice them in half. Drizzle a few tablespoons of olive oil on a rimmed baking sheet, spread out the oil over the bottom of the pan, and sprinkle on a generous pinch of salt. You could also scatter over some fresh herbs such as thyme or marjoram and a few whole cloves of garlic. Arrange the roma tomato halves snuggly on the sheet. I arranged them cut side down, which let them stew in the olive oil, but I've also seen recipes that put them cut side up, which would dry them out more and caramelize them a little. I fit about 3 lbs of tomatoes per large baking sheet. Slow roast them at 200 degrees for 10-12 hours. 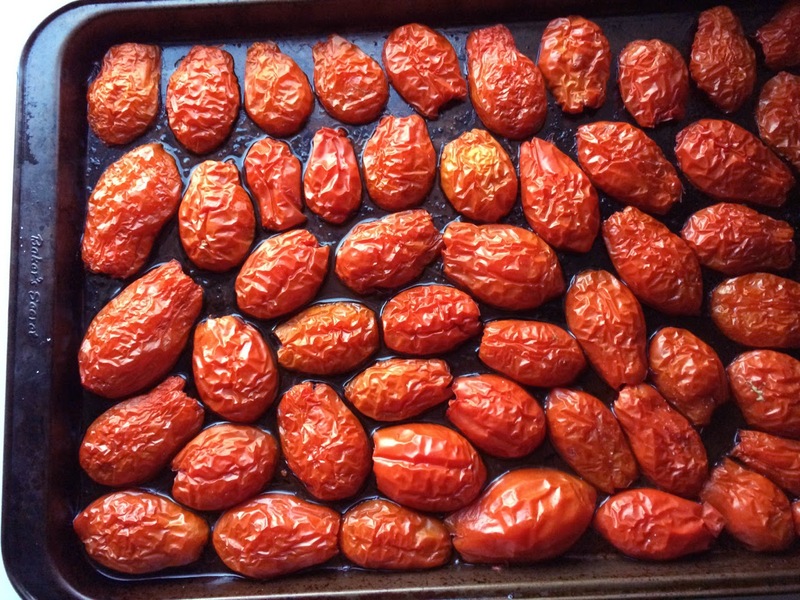 This works well if you do it overnight, although the delicious roasted tomato smells may wake you up early in the morning. Cool them and freeze them in freezer bags for use in salads, pasta dishes, pizzas, BLTs, etc. Slice the tuna into 1 1/2 inch cutlet. Sprinkle with salt and pepper and allow the fish to warm up to room temperature. Arrange the tuna pieces into the smallest saucepan that will hold them in a single layer and then pour over enough olive oil to cover the fish. Add the garlic cloves and herbs, submerging them as well. Bring the oil to a gentle simmer over low heat. You can monitor the temperature of the oil with a kitchen thermometer, and it should not get above 150 degrees. Cook the tuna for about 10 minutes or until desired opacity, then turn off the heat and remove the tuna from the oil. Smash the garlic cloves into the oil and allow to cool. Strain the oil and reserve. This fragrant oil can be refrigerated for a week and used in salad dressing (see below) or in a sauce such as a quick puttanesca made with slow roasted roma tomatoes. 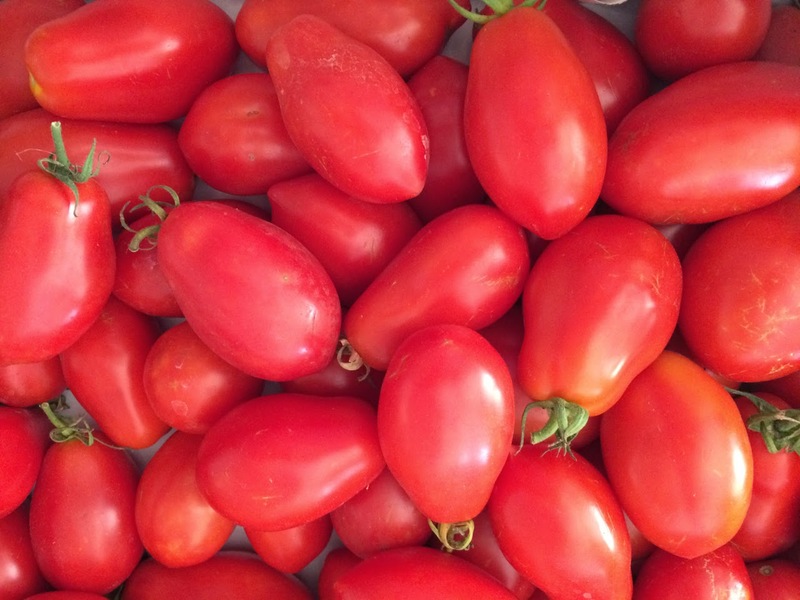 On a large platter, arrange a layer of slow roasted roma tomatoes. As soon as the tuna is poached, place it on the layer of roma tomatoes to infuse the flavors. 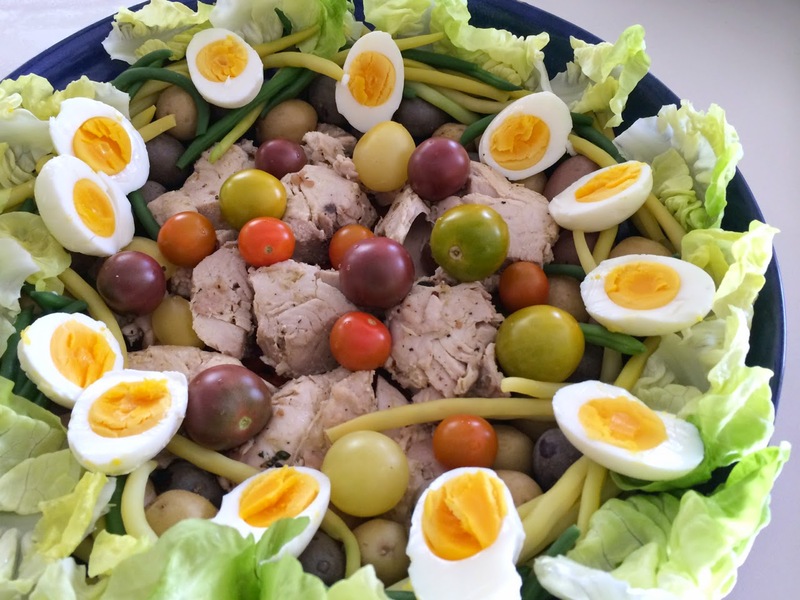 Around the edges of the platter, arrange lettuce leaves, potatoes, beans, and halved hard boiled eggs. Scatter the cherry tomatoes over the tuna. Sprinkle with salt and pepper to taste. When you are ready to serve, whisk together the oil and vinegar and pour most over the perimeter lettuce, beans, and potatoes and a little over the central fish. Enjoy with fresh bread.